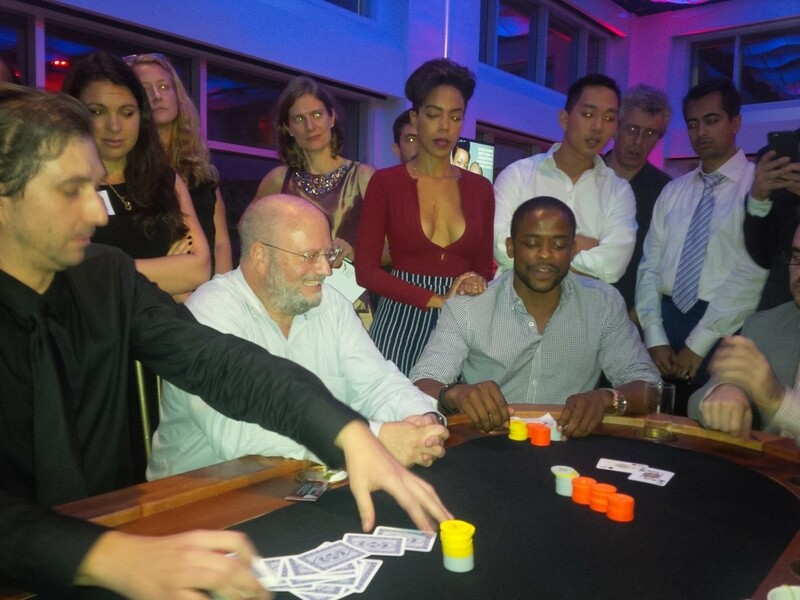 David Perlmutter‎ in action at final table in last night’s Urban Blinds and Justice charity poker tourney. Actor Dule Hill is on his left. Perlmutter finished 8th. Yours truly finished 3rd and had the chip lead 4 handed before getting cold decked. Busted like a dozen people, maybe more. Sucked out many times to get there including when my 95 o/s busted Eric Seidel after he shoved his short stack w J7 suited – I called from the Big blind. I got k8 to beat aq, kq to bust aq when a king flopped etc. No, Dule Hill’s girlfriend did not have a wardrobe malfunction – that is how it was meant to be worn. As always with Begs the story begins with a crazy run of cards. This one had Steve saying, “I really need to go home–I have to get up early” followed by 4 shoves and 4 wins, including making a runner-runner straight to knock out a woman who had the nerve to be surprised that he hit it. Very fun event! Begs was chip leader until he uncharacteristically started playing with premium hands. Then things took a turn for the worse. He finished in 3rd, not 4th. I finished in 9, not 8. But it was 1:30 on a school night so things got a little foggy toward the end. Begs had the misfortune of having a drunk woman standing behind him to the right narrating the final table to some unseen audience on her phone, probably on Periscope. She was nattering on and on and on. It took every ounce of his decency not to jam her phone where the sun don’t shine since she was plumping for Daniel Negreanu and Andy Frankenberger the whole time. Vanessa Selbst, who organized the benefit is aces in my book, as is Andy F. Daniel was animated and fun, Erik Seidel was quiet and pleasant. Justin Pugh from the Giants just wanted to go get some sleep. He kept shoving and winning. That went on about an hour. If only the Giants could shove and win. Eric Bogosian, one of my performance art heroes gone mainstream was very nice, too. Dulé’s girlfriend got the décolletage trophy (turns out she is in HBO’s Ballers).